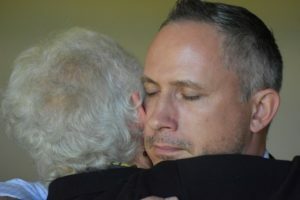 Heroes’ Voices continues to wage war on Post Traumatic Stress and other health challenges related to military service. For the last five years, Heroes’ Voices has been touching the lives of thousands of veterans with the healing power of music and poetry. Over the past year we have done music and poetry workshops with vets at facilities such as the San Francisco VA, Menlo Park VA, Livermore VA, and the San Francisco County Jail. We continue to sponsor “Guitar Corps” programs at the San Francisco War Memorial Veterans Building. We initiated new programming at the Redwood Vet Center in Eureka, CA in cooperation with Humboldt State University. Our national outreach continues to grow through the National Veterans Poetry Contest, produced in cooperation with George Mason University and the Hylton Center for the Performing Arts in Manassas Virginia. Over 120 veterans from 37 states submitted hundreds of entries to our 2018 National Veterans Poetry Contest. We featured music and public readings of the winning poems in performances of The Soldiers Journey in San Francisco and in Manassas. These performances give veterans the opportunity to inspire audiences on both coasts, and they facilitate many healing interactions – including this touching moment between and Marine Veteran Richard Gibson and Gold Star mother Mary Shea. and a plastic bag of clothes. these are the things you carry. only to be rousted out at dawn. Home but without a home. The chap book is available upon request, while supplies last. You can also read the winning poems at www.heroesvoices.org/poetry. We will launch our third annual National Veterans Poetry Contest in early 2019. We need your help to continue helping our veterans. As we commemorate the hundredth anniversary of Armistice Day, which is now called Veterans Day, please consider helping those who have sacrificed so much for us. Please help us continue to fight this battle against the darkness of PTSD and bring light into the lives of our veterans. You can make your donation at www.heroesvoices.org/donate.